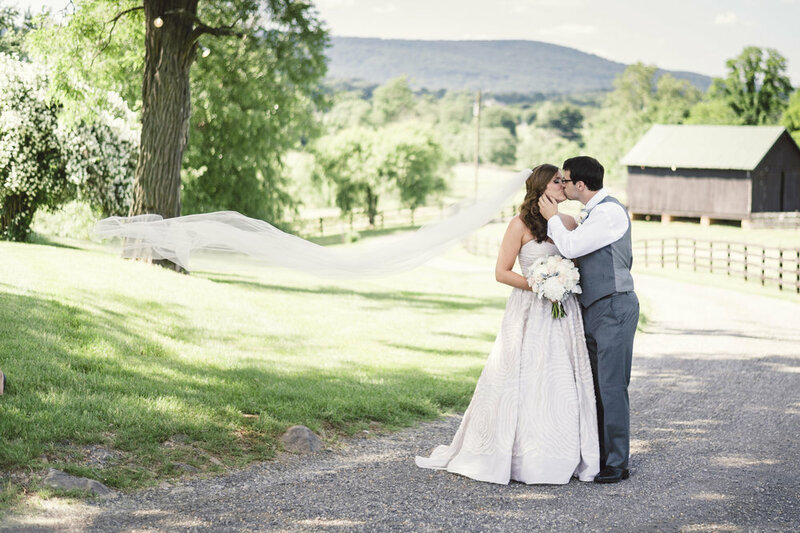 Silverbrook Farm is a private wedding and event venue nestled at the foothills of the Blue Ridge Mountain range, just a short 1 hour drive from Washington D.C. and conveniently located in the heart of Virginia Wine Country in Loudoun County. With stunning views of the mountains from your ceremony site, this 1700's property captivates all who enter its grounds with its idyllic gardens, woodland backdrops, and its historic barn and country home. Brides choose Silverbrook for its relaxed ambience. Family and friends are welcomed to the estate by Dot Shetterly, the owner and caretaker of Silverbrook. Dot welcomes everyone with open arms and a full heart. Silverbrook is also an operating B&B, which allows the bride and groom the option of staying at the farm for their event. The B&B is not open to the public during wedding weekends and Silverbrook hosts only 1 event per weekend. Whether sitting on the rockers on the rear porch sipping wine, or taking a stroll through the formal English garden, you will leave with plans to return to this restful and picturesque place. Dot went above and beyond..